Garfield County is moving forward with the most modern, secure voting technology available, the new Verity® Voting system from long-time election partner Hart InterCivic. Taking delivery in mid-March, Garfield County officials made their choice based on a history of outstanding support and trustworthy equipment from Hart. 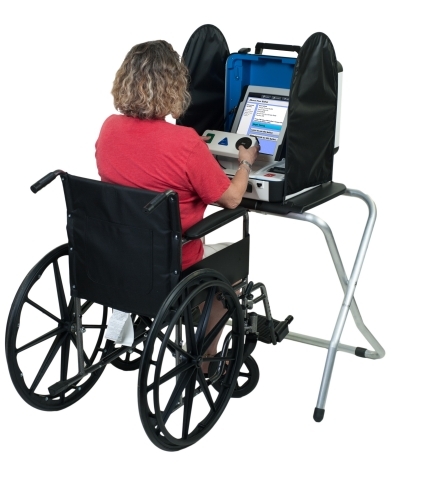 The Verity Touch Writer ballot marking device provides true equality of access to all voters, with adjustable video and audio settings, the ability to use adaptive devices that meet ADA standards and many other voter personalization options. In keeping with state rules, Garfield County will have a unit at the courthouse. “Hart makes good products, and we’ve been happy working with them. The equipment is so reliable that I may go a whole year without needing to call with an issue,” said County Auditor Donna Deal, who has more than 30 years’ experience working with elections. As Garfield County officials weighed options for new voting technology, they worked with neighboring counties Asotin and Columbia. Ultimately, all three chose Verity to support their joint continuity of operations planning (COOP). With their first election scheduled for August, Deal is looking forward to Verity’s efficient ballot design process using Verity Build. “It’s a very simple ballot, but I’m expecting that what used to take me two days will take only a few hours now,” she said. The County will also debut the Verity Touch Writer unit for ADA compliant accessible voting. The unit is a standalone ballot marking device with an audio tactile interface (ATI) that allows voters to generate a paper ballot marked with their selections. The ballot is counted following regular processing procedures for by-mail ballots. Austin-based Hart InterCivic is a full-service election solutions innovator, partnering with state and local governments to deliver secure, accurate and reliable elections. Working side-by-side with election professionals for more than 100 years, Hart is committed to helping advance democracy one election at a time. Hart's mission fuels its passionate customer focus and a continuous drive for technological innovation. The company's new Verity Voting system makes voting more straightforward, equitable and accessible—and makes managing elections more transparent, more efficient and easier.